Even the best projects, with the most talented team and the most well-intentioned backers, can effectively do only as much or as little as the amount of attention they’re able to attract, and sometimes, such as in this instance, that might mean finding a way to raise cash in order to get the opportunity to reach a wider audience. Urban farming, while not nearly as new of a concept as many of us might think, is nevertheless still considered to be somewhat of a fringe activity by many people who’ve not experienced the benefits and advantages of growing food right close to where it will be eaten. And to really launch urban farming in a big way, a lot more support and demand for local food, as well as the resources to grow it, will be needed, which is where documentaries such as this one, Growing Cities, comes in. 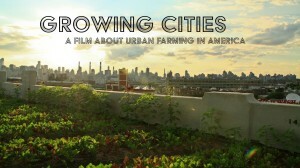 “GROWING CITIES is a feature-length documentary that examines the role of urban farming in America and asks how much power it has to revitalize our cities and change the way we eat.The film follows two friends on their journey across the country as they meet the men and women who are challenging the way this country grows and distributes its food, one vacant city lot, rooftop garden, and backyard chicken coop at a time. Since its release, the film has been an official selection at more than 25 film festivals, as well as being screened in more than 200 communities, and has received a lot of great reviews. Now the filmmakers have the opportunity of getting the film in front of a lot more people, through being broadcast nationally on PBS this fall. This could give the film a huge reach, but in order to take advantage of it, the filmmakers need to come up with funding to cover the cost of everything involved in getting it to American Public Television, including editing and remixing it to meet PBS broadcast standards. If they can raise $30,000 to cover all of those expenses, the Growing Cities team has a great chance of reaching a lot of viewers this fall, and to get there, they’ve decided to seek (wait for it…) crowdfunding, with another Kickstarter project. If you’d like to see this urban farming film, which is about a lot more than just growing food in the city, get broadcast nationally this fall, chip in a few bucks to their current Kickstarter campaign, or share it with your network to help it get funded.